You may have noticed a change in the captioning of our “Get Sohrs’d” Campaign. We are shifting to “#BeTheSohrs”. We felt that each person (Christian that is) plays a vital role in the lives of those around them. You’re the source of light, hope, direction, encouragement and edification to those you encounter. So be what you are, the sohrs. We’ve reached the midpoint of our year and those resolutions that we started the year off with may, for many, be a distant memory. As Christians, we know that just because we slip, stumble, and fall, we can get back up again. 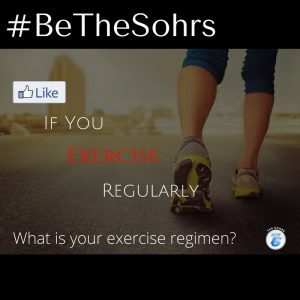 This week’s “#BeTheSohrs” topic is “what’s your exercise regimen?” And in normal “Get Sohrs’d” fashion, it’s time for each of you to do what we (Christians) do best, #BeTheSohrs!